Why not enhance the sport you love so much with a custom fly rod made just for you, for how you fish, & unlike any other rod? My rods are available at many different price levels making them some of the best values for top-quality hand made fly rods on the market. For every rod you purchase I offer a five day inspection period in which you can return the rod to me for a full refund -in unused condition- if you decide the rod is not for you. Purchase a custom fly rod from me without risk or worry. No matter if you prefer traditional split-bamboo, or a modern synthetic rod of fiberglass or graphite, when I make a rod for you we work together to get you a fly rod you'll truly enjoy using at a price that won't break the bank. For a completely unique rod I encourage you to look at the mortised rods page. These rods are truly unique & collectible They are where history meets artistic innovation in the form of a fly rod. Also be sure to check the "available" page to see what completed rods are currently listed. My custom fly rods are not mass produced in a factory. I hand craft each & every rod. 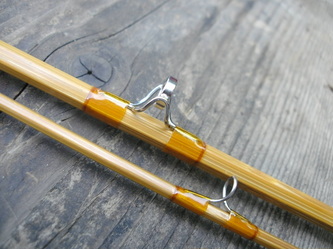 My split-bamboo fly rods are all hand planed from start to finish. I make many of the components for the rods myself by hand & I focus solely on the quality of materials used. With this as my guiding principal I strive to make my rods from raw materials & components that are MADE IN THE USA, with the exception of the Tonkin bamboo that only grows in a small area of China, the highest quality cork in the world that is grown in Portugal, & the finest Japanese silk available. Whenever possible, I use rod blanks for my modern synthetic custom fly rods that are made in the USA. I will always use the best quality materials & components. Whenever possible I buy raw materials & components from small local businesses to support my local economy & to help keep jobs in America. Each rod I make comes with a personal inscription of what ever you want on the rod. 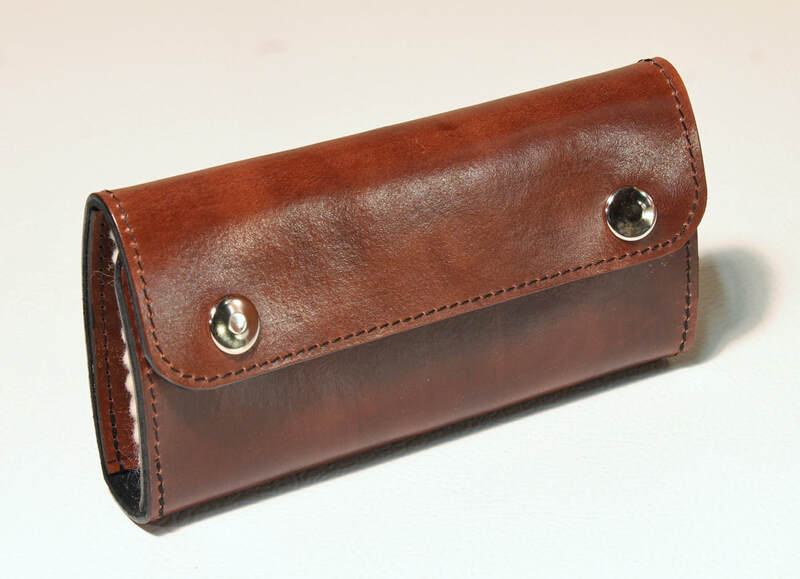 In addition, I make by hand, an entire line of top quality fly fishing accessories in my shop including leather fly wallets, leather leader wallets, fishing bags, rod & reel cases, rod tubes, & more. These are some of the finest accessories being made & I'm very proud of them. For news from my shop, interesting reading, industry news, book reviews, & a host of other things check out "The Pliant Rod" on this site as well. I hope this website can also serve as a resource of information for all fly anglers. 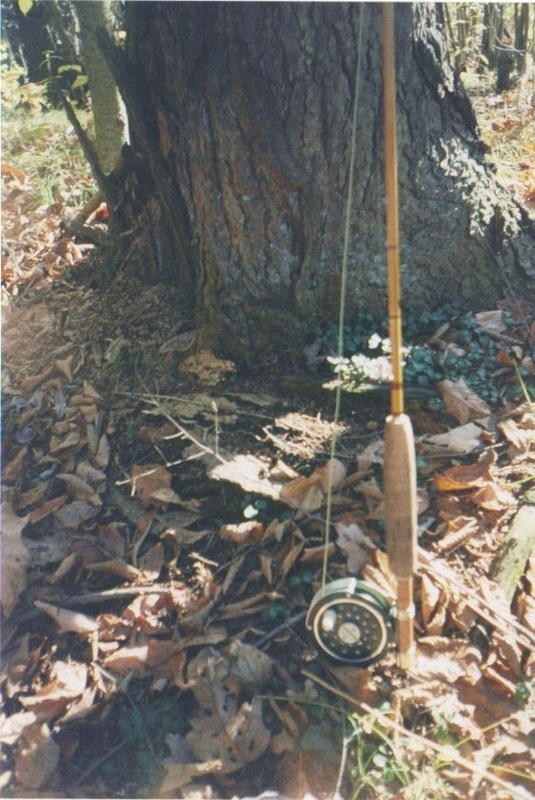 Please see the "Tackle Tips" page for info about how to care for, maintain, & repair fly rods. 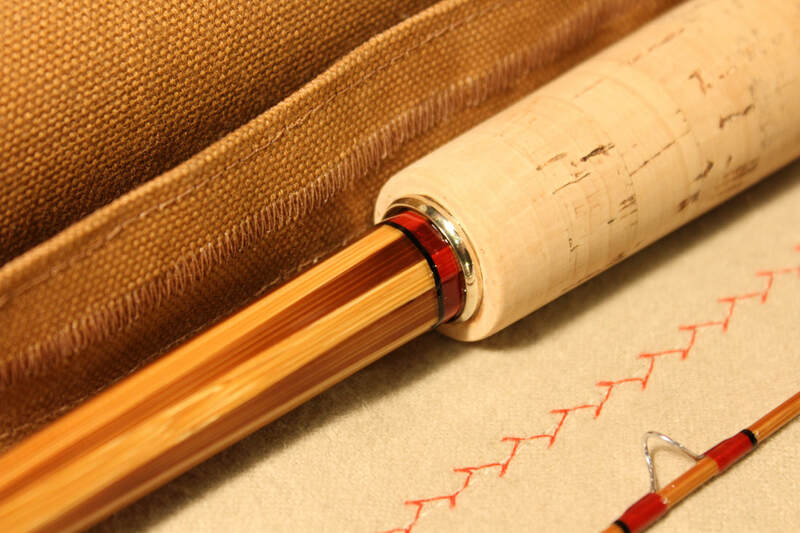 Please also visit the "Designing Your Custom Fly Rod" page to explore all the different aspects & components of a fly rod. In addition, please check out my "Rod Making Philosophy" page to read my thoughts about making fly rods, how to choose a rod maker, & advice about buying your first bamboo fly rod. Do you have questions about how to get a custom fly rod or the other services I offer? Please see the "Frequently Asked Questions" page for the answers. I want to provide you with a level of service higher than you'll find anywhere else. 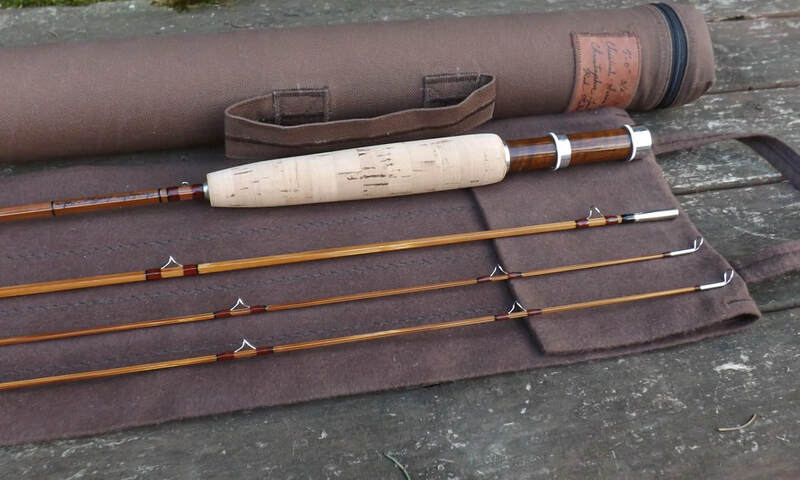 Why buy a fly fishing rod that was built by people halfway around the world you'll never speak to, when you can have your fly rod custom made for you? It will be my privilege to make you the rod you've always wanted & will be proud to own; the fly rod that will be a part of the many beautiful days you spend on the water. 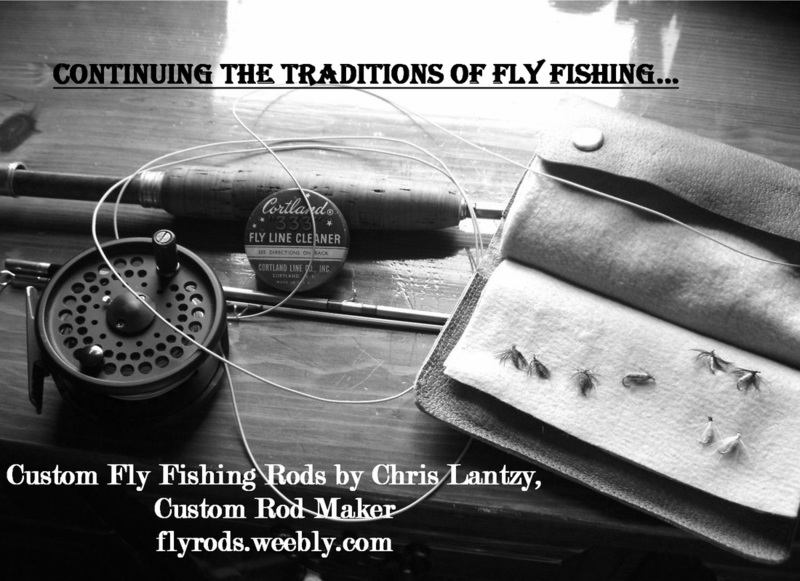 "Chris Lantzy has created both beautiful graphite and cane rods for Project Healing Waters Fly Fishing. I am sure that anyone purchasing a rod from Chris would be most pleased." - Ed Nicholson, President, Project Healing Waters Fly Fishing, Inc. So, why purchase a fly rod from a custom maker as opposed to a large company? The reasons are many. 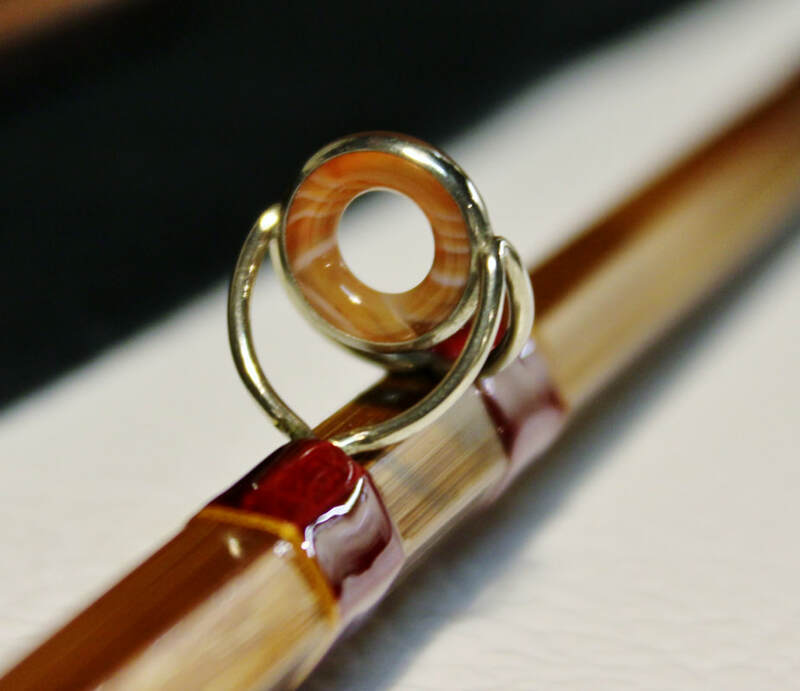 First & foremost is the personal attention you'll receive from an individual rod maker. When you purchase your rod from me you won't be another number in a file or sales chart. Both your name & mine are on the rod I make for you. I want you to fish with a rod we can both be proud of. Large tackle manufacturers are guided by many factors when they design a rod. More often than not, it comes down to them choosing between the cost of making a rod & the profit margin for each rod they make, number of rods sold, cost of advertising, etc, etc. 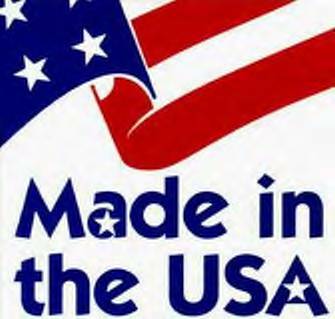 While many companies are moving their manufacturing facilities over seas for cheaper labor, my rods are all proudly made in America, by an American. I do not compromise between quality & quantity in my rod making. I focus on quality. This is my guide in all aspects of the rods I make. Unlike the large tackle manufacturers where you buy what they have designed, when you purchase your rod from me we work together to get you a rod designed & made for you specifically. You have control in all aspects of designing your custom fly rod. All this for less than the cost of some of the higher-end manufacturer's prices!!! What sets my rods apart from others? Well, you do. A rod from me will be what you want, not what some corporation thinks you'll like. That's the kind of personal service you get from a custom rod maker. Just like the owners of small fly shops, custom rod makers want you to succeed & enjoy fly fishing. I urge you to support your local, independent fly shop & to consider buying your next rod from a custom rod maker. Together we'll plan a rod that will enhance your time on the water & the sport you love. If you have any questions, concerns, or are seeking advice I'll be happy to help in any way I can. All fly anglers should feel free to contact me anytime. 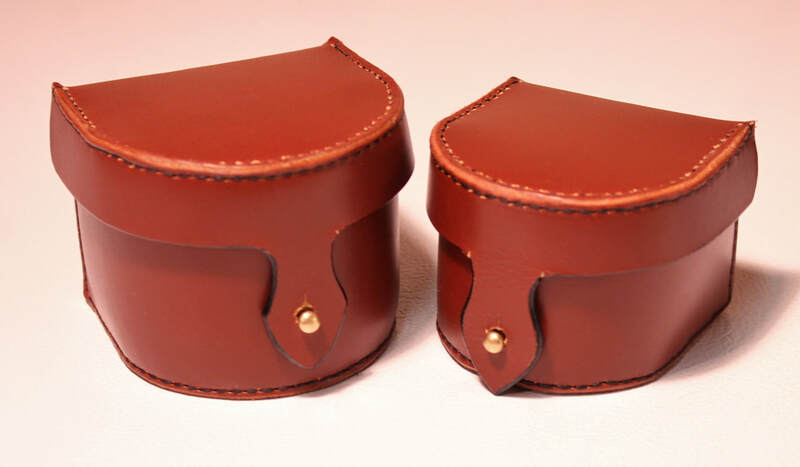 In addition to all the standard canvas accessories offered, I also make a full line of hand crafted Leather Accessories for your fly fishing needs. Each item is made completely by hand, from start to finish one stitch at a time. I'm also able to make any custom accessory that you might have in mind but can't seem to find anywhere. Please contact me to discuss all your fly fishing accessory needs. 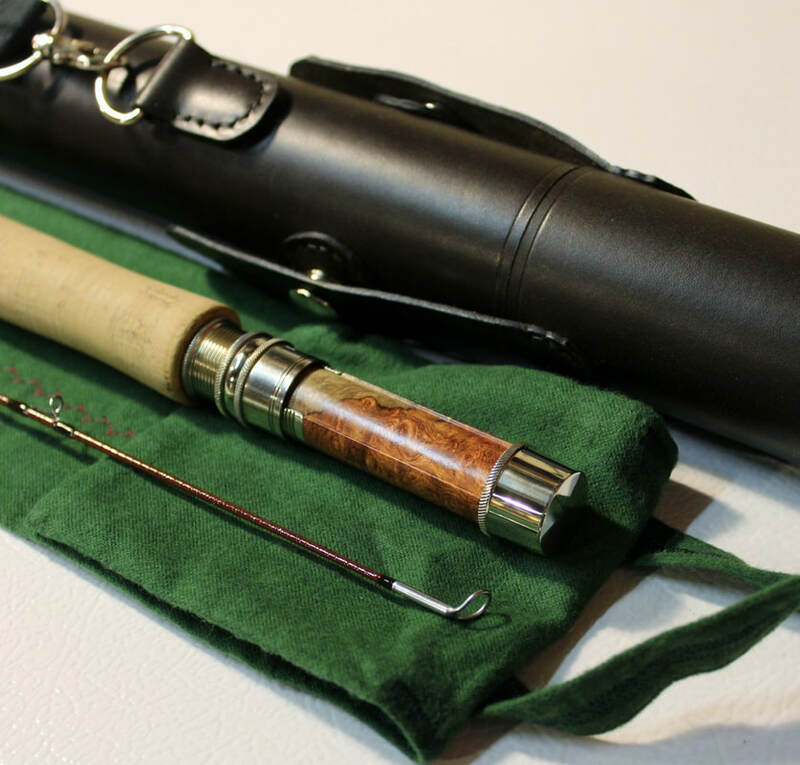 Graduation, retirement, birthdays, anniversaries, or that special Holiday gift - for a truly memorable gift, you can get that special angler in your life the gift of a custom fly rod. Bamboo, fiberglass, or graphite rods - there's a special rod for every angler. Here's how it works: You & I discuss what grade of rod you'd like to give them & I might have a few simple questions for you to help me figure out what they need in a rod. 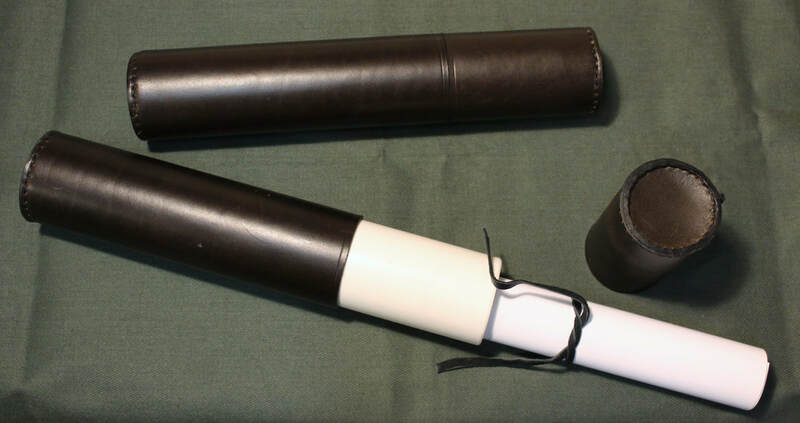 Then after you've made the down payment, or paid in full if you wish, I'll mail you a special certificate that states a custom fly rod has been ordered in your recipient's name for you to give them on the special day. The certificate is printed on special heavy weight photographic paper with a personalized hand written section inviting them to contact me. Think of it as a gift certificate for a custom made fly rod. After you've surprised them with the certificate, the lucky angler can contact me & the two of us will work together to design the rod exactly how they want it, with all the personalized customization just for them. We communicate & interact as much, or as little, as they wish. If they aren't sure what they want or need their rod to be I can offer many suggestions, showing them photos & offering advice. They (& you) are kept updated as the rod is being made with frequent progress reports complete with photos of their rod as it comes to life. You'll always know where it is in the process. In this day & age most folks will never get to experience having something tailor made, by hand, just for them individually. You're not just giving them a custom fly rod, you're giving them the experience of interacting with the rod maker & designing the rod of their dreams. The joy of giving a gift certificate for a custom fly rod is threefold: first when the certificate is presented to them, then the anticipation builds as we design the rod & it's being made, & then a lifetime of the fun & pleasure of fishing their very special fly rod. Having a rod custom made is an awesome & memorable experience for any angler - one that will only serve to make the rod of their dreams even more special. Please contact me to discuss a special fly rod for a very special angler. For more information & to see many more photos of these & all the other currently available rods, please visit the Available Rods page. Should you have any questions about anything you see there, please contact me. This website is updated often. Last update: April, 2019. Please visit my Flickr pages (www.flickr.com/photos.customrodmaker/) to see even more rod photos including those available for sale, different rod features, & more including photos from inside the rod shop & along some gorgeous trout streams, too. I'll be continuing to add photos there, so check it often.